Imagine you are travelling along the River Seine in a north-westerly direction from Paris. You enter the Eure département of historical Normandy. Then something catches your eye. A large circular castle standing on a huge mound. It looms some 90 metres over the commune of Les Andelys on the River Seine. You are seeing the stalwart medieval castle known as Château Gaillard. Construction on the castle began in 1196. It was built for the King of England, Richard the Lionheart. At this time King Richard was also the Duke of Normandy. It was a massive castle with a considerably advanced design, employing the principles of 'concentric fortification'. Its complexity notwithstanding the castle was completed in the record time of just two years. It was built at the same time as the town of Petit Andely, which it overlooked. Today, the castle is in ruins, but it is still an awe-inspiring sight. On 8 June 1954 France issued a set of seven stamps featuring French Monuments. 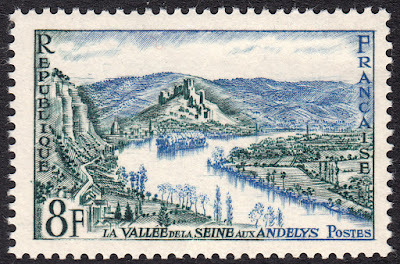 The 8f value features Château Gaillard and Les Andelys on the River Seine. According to Phil-Ouest, Albert Decaris only designed this stamp. But I cannot find another name on the stamp, which usually, from what I've seen, means that it was both designed and engraved by the one person. So I'll assume Decaris engraved this stamp also. If anyone knows differently, I'd love to hear from you. 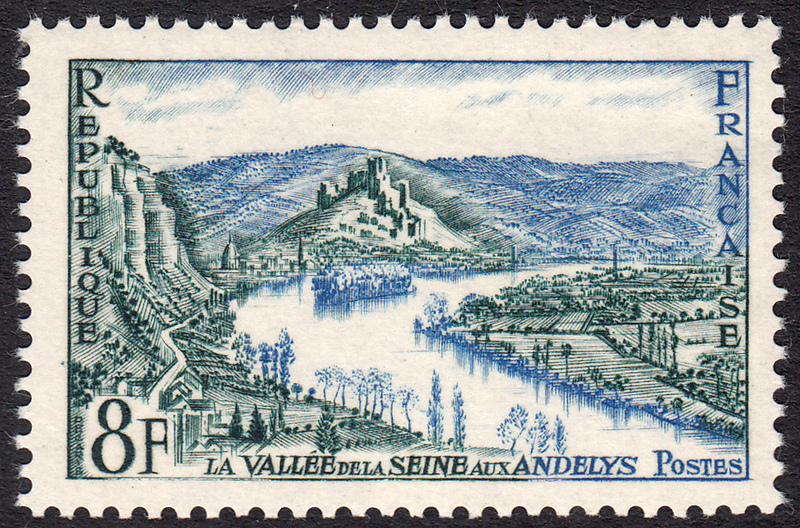 In this design, the River Seine sweeps through the centre of the stamp, drawing the eye towards the middle distance where the ruin of the medieval castle, Château Gaillard, stands proudly. Below the castle to the left is the commune of Les Andelys. Lovely description, Florian! I totally agree!